Working on a valentine with frogs. Have done it as a reflected piece, adding and overlaying in photoshop to see how I can make it a bit less flippy...putting things on the spine, stripping in stuff into the black. Am taken with doing a leafy frame with an animal inside ...with some sort of play between an animal and bird/ heart. Also on the tiger drawing with a leopard in the plans. This Janist painting style is very stylized (which I love) and have lovely conventions like crazy geometries and decoration and the figures do things the human body would never concieve of. 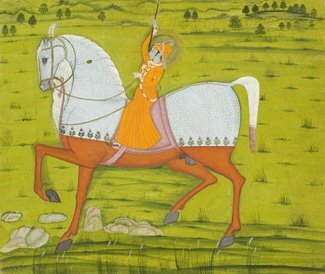 There is an illustration in my wonderful book (From the Ocean of Painting, India's Popular Painting from 1589 to Present by Barbara Rossi (ISBN0-19-511194-x)) of archers kneeling within a shape in the upper part of the image described entirely by arrows facing in, and these archers are shooting out. What if that shape was a heart, there is a valentine there...beyond cupid and his dinky arrows that prick but not eviserate. These indian guys are not messing around in their picture. 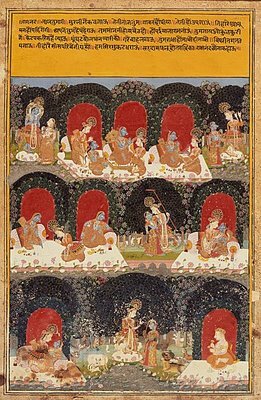 Specifically, these images that I have fallen in love with are from the Deccan area of India...and as they are for the populus versus the elegant Indian Paintings I have been trying to imprint on my brain. With the popular, the conventions are stronger--the images more iconic as they have to be knocked out to sell a lot of them. There are pilgrimage paintings created with the same imagery--some rendered more simply than others...but the same mannerisms, same decor, same pose of the figure. I have been plucking images out of the marginalia of these pictures for details in these valentines. Sweet. I just tried to find these tigers online to share with you. 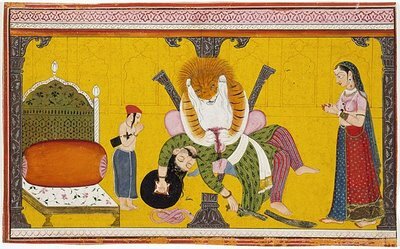 Turns out, LACMA has a significant collection of indian art that they purchased from the collections of Nasli and Alice Heeramaneck. Heeramaneck was a collector whose works were sold by Sotheby's--and there is a catalog of the entire collection. LACMA also has quite a few wonderful examples online to review. I just adore this stuff. Look at those nutty palettes. Not quite the great grey/blue north that I live in...but believeable in Miami.